This coloured drawing is from a 16th Century manuscript of Janus Lacinius, Pretiosa margarita novella (The new pearl of great price), no. 16752 in the Germanisches Nationalmuseum in Nurnberg. We will see that it relates to the image that I recently described under the posting on the Death and Resurrection of the King. The link begins at the bottom of each image, where we see four columns, black, yellow, white and red, four of the stages often described in alchemical works. In the Lacinius these are placed in the gateway into a semicircular enclosure, and support a red globe in which we see a bird and a snake. Immediately behind these are two naked figures, a man bearing a Sun on the left and a woman bearing a Moon on the right. Each have a key at their waist. Above their heads are a Sun and a Moon. Clearly we have the same constellation of imagery in each of these two emblems. This symbolic link continues when we notice a little cherub, lying horizontal and appearing to float in the space behind the two foreground figures. This is in a similar posture to the dead king in the Leiden manuscript, and the corpus in the Martin Sturtz manuscript we have also examined. We also see two little figures above the prostrate cherub. One is a cherub rising up and the other seems to be a similar cherub descending down. We have seen this particular interaction of figures in both the Leiden and the Sturtz manuscripts. Now the symbolism begins to diverge before coming together again. The foreground action which we have been looking at is taking place in a semicircular enclosure which is attached to a strange triple walled enclosure. Entrance can be had to these inner enclosures through three doorways, each of which is open. The outermost wall bears the image of Taurus the Bull (one of the astrological earth signs), the middle wall has Leo the Lion (a fire sign) while the inner wall has Saggitarius the Archer (also a fire sign). Here there is a somewhat of a divergence with the Leiden where the archer also appears but in the act of shooting an arrow at the King in the tree. The inner wall is coloured red, and within the space it encloses stands a tree bearing six round fruit. At the foot of the tree trunk a raging fire is burning filling the entrance way. On the ground at the base of the tree are two figures seemingly engaged in a discussion or debate. The one on the left bears a crown. To the left of the tree are a conjoined Sun and Moon, while to the right are seven stars, most likely a reference to the seven planets. In the centre of the tree sits a red Queen, with her arms outstretched perhaps gesturing towards two male figure floating in clouds above her. The one on the left has a little owl on his head. Above the tree in the central top of the emblem are the words Elixier Completum (the elixer is completed). 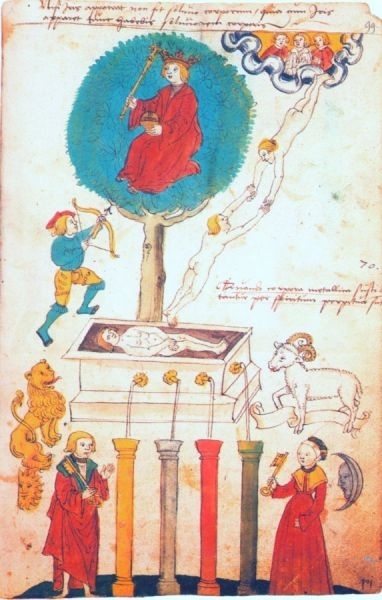 Although the Leiden manuscript which we read as a death and resurrection of the king, appears to use much the same imagery as this image in Nurnberg, these have been differently put together. It is not so easy to read the Nurnberg from the top down as we did with the Leiden. The queen sits in a tree with the six planetary fruit. A fire burns at its roots. Is this a death process, a funeral pyre, or a resurrection? Is the triple walled enclosure intended as an image of a furnace, or is this a protected space in which the elixir is completed? It is not clear. 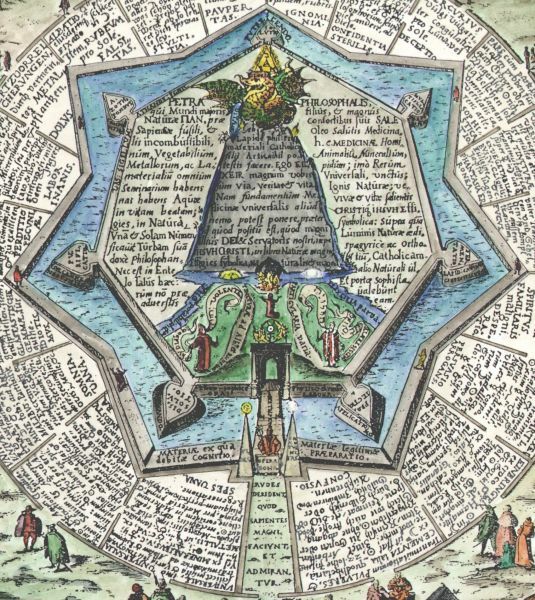 It seems as if two alchemists in the 16th century used the same imagery in creating their alchemical emblem but each with a different intention. This is one of the difficulties found when exploring alchemical symbolism - one does not always find certainty, but different complex reworkings of the same symbolic elements. This either frustrates and infuriates those who want some absolute clear picture, or the viewer just takes delight in exploring the variations. I belong to the latter camp. 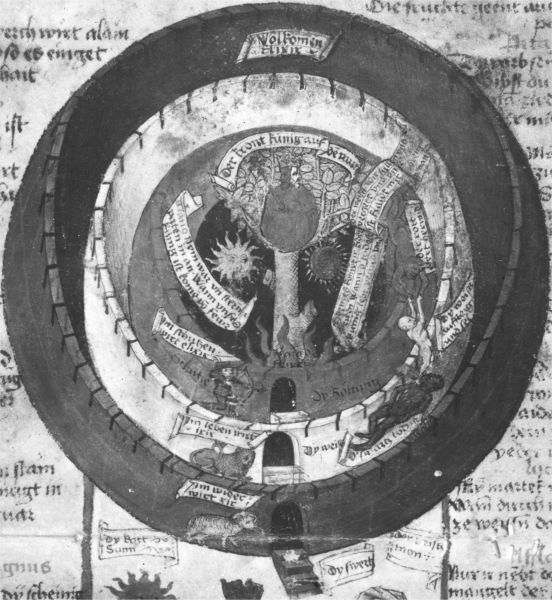 Superficially, there is a similarity to an image from Heinrich Khunrath's Amphitheatre Sapientiae Aeternae, 1609, as both images show a space enclosed by a series of walls, with an outer courtyard. Khunrath's emblem is entirely explained by the text on the engraving. One can describe this as a heptangular fortress with twenty gates and one open portal at the bottom. The twenty gates that do not allow entry into the central space are each labelled with a disappointment and a vain endeavour. Thus for example one is labelled "Burning toads and salamander work; likewise creating a basilisk for transmuting silver into gold - Poverty", while another has "Trying to make the Universal... or tinctures for transmuting to silver and gold, from humans as a whole, or from animals or parts of them, or their excrements... - Empty Dreams". The only entrance is through the narrow footpath of truth shown at the bottom. Let us now look at the central area of this emblem which Khunrath has depicted as a "citadel... in which alone Jehovah has placed the panacea, or universal Philosophers' Stone". This image was printed over two pages and the central area usually proves impossible to scan as it disappears into the page fold, so unfortunately I cannot find a very high quality scan of this image with this area clearly depicted. My own coloured version is as good as I can get. The entrance to this citadel is along a path which leads to a drawbridge across a moat. On the landward side are two pyramids, the left topped with a Sun being 'fides' (faith) and the right topped with a Moon is 'taciturnitas' (keeping silent). Between them stands a philosopher holding a caduceus before which is a large stone bearing the words 'opera bona' - good works. The adept seeking wisdom then has to cross the drawbridge - sadly I cannot make out the word engraved here - then he comes to the portal guarding the entrance to the citadel. This has 'non omnibus' (not for all) inscribed on its lintel. Above this is a double ouroborus with two winged dragons, who enclose a symbol seemingly built from the glyphs of the seven planetary metals. Some people associate this with Dee's hieroglyphic Monad symbol but I think here we have something different. I will post some more detailed scans later. Once into the citadel the aspiring seeker is approached by two philosophers with drawn daggers, speaking sentences in Latin and Hebrew of advice and warning. The side of the path he is treading state 'the tincture for the white and red' and the 'various particulars'. We see this aspirant on his knees gazing at the large central mountain. In the pool at its base are a Sun and Moon and in the centre a little dragon guarding the entrance to a cave. On the top of this mountain is a larger winged dragon above whose head is the light filled triangle of the Trinity. 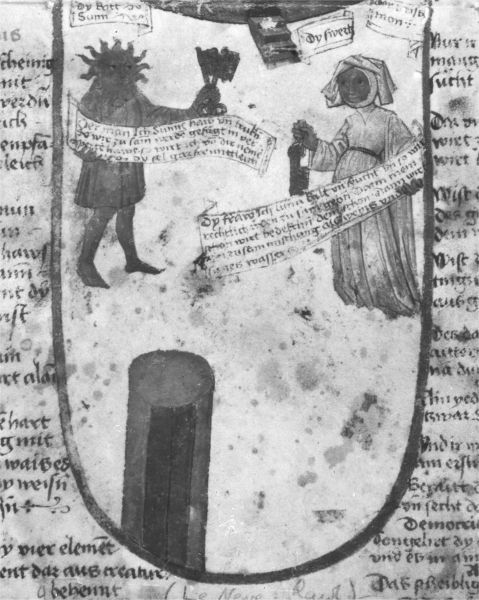 Its head bears the 'Gloria', the neck 'Sapientia', the wing on the left has 'a long life' while the other bears 'wealth' the two main attributes of the philosophers stone as seen by the early modern alchemists. On the dragon's tongue is 'Aqua Vita' the healing water of life, another atttribute of the stone. The text on the mountain states : - "Without me you can do nothing with the Philosophers' Stone, the primal universal material, the Son of the Art. I am the great Elixir to you, the way the truth and the life. For no one can propose any foundation for the Universal Medicine, other than the one laid, by the great God Himself and our servant Jesus Christ, in the great Book of Nature, which is the great symbolic natural image." 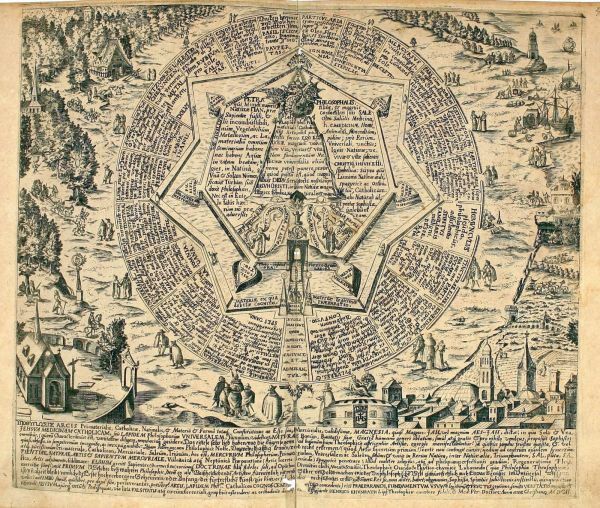 Most commentators on this engraving of Khunrath describe the symbol in the ouroboros as being John Dee's Hieroglyphic Monad. While it seems certain that Khunrath will have known the work of Dee, and was probably familiar with his Hieroglyphic Monad glyph, when we look at the symbol as engraved on the Khunrath plate we note a clear difference. The base of the symbol has on the left, half a straight arrow, differing from that of the Hieroglyphic Monad, while on the right is the little crescent or quarter moon. 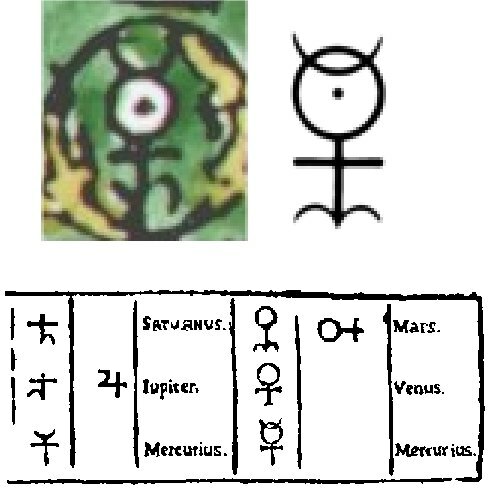 In the image below, I show on the left top, the Khunrath, on the top right Dee's Monad, while below is one of the diagrams from Dee's book on his Hieroglyphic Monad, which analyses it against the symbols of the planets. It is obvious that Khunrath has here introduced a similar image, in which he sought to bring together the symbols of the seven planetary metals, but in a different way from Dee. Dee's complex ramifications explored in his book need the two little crescents at the base. Perhaps Khunrath's intented a much simpler concept for this bringing together of the planetary metals, and wanted to somewhat distance himself from the complex esoteric and philosophical ideas that Dee wanted to capture using his image. I have just found a precursor of the 'Queen in the Tree' image. This is a coloured drawing a manuscript Rawlinson D.893 in the Bodleian Library. The manuscript is apparently a collection of manuscript fragments, probably bound together in the 17th century. 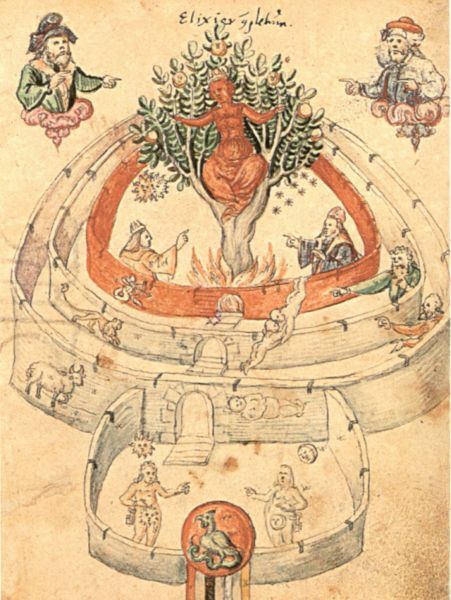 The single folio related to alchemy bears a coloured drawing. Sadly, I have only located a black and white image, and though I have tried to improve the image digitally, it is still not especially clear, however, one can make out the two castellated walls of the garden with a tree within this, flanked by the Sun and Moon. An outer courtyard is seen below with the male and female figures bearing keys to unlock the gates to the garden-castle. The manuscript is in German and dates to the last third of the 15th century, a rather early manuscript with images. I would like to have a full colour scan made but the costs are rather high. I have managed to find a higher resolution image (albeit in grayscale) of the Rawlinson and show it here in two sections in order to preserve the detail. The first thing we notice is that this no longer depicts a 'Queen in a tree', and instead we find a two faced male figure, the face on the left being a dark colour (possibly red?) while that on the right is white. Underneath on the left is a Sun and on the right the Moon. This would appear to be a King as he holds an orb and sceptre. As in the Lacinius the tree has a fire at its base and is set within a circular walled enclosure (possibly red as in the Lacinius). To the left of the door of the innermost enclosure we find an archer, while the middle white enclosure has a lion, and the outermost has a ram. I misread this in the Lacinius as Taurus the bull, but it would appear to have been intended as Aries the ram, as these three are all astrological fire signs and thus are likely to represent the different grades of fire to be applied in these three enclosures which can be interpreted as stages in the alchemical work governed by fire. On the left we see the three naked human figures, spanning these three enclosures, one as a corpse lying upon the ground, another as a white figure rising up, and the third a dark (possibly red) figure reaching down to embrace and receive the white figure. (How good it would be to have a colour reproduction! as this is clearly colour coded). The outer courtyard shows imagery similar to the Lacinius but here the male and female figures hold keys. Also at the base is a multicoloured column. This relates to the variation of this emblem found in the Leiden manuscript I looked at in the thread on 'Death and resurrection of the king'. It would require a German specialist to read the labels and this would throw much more light on the imagery. I myself cannot make out more than the occasional word. 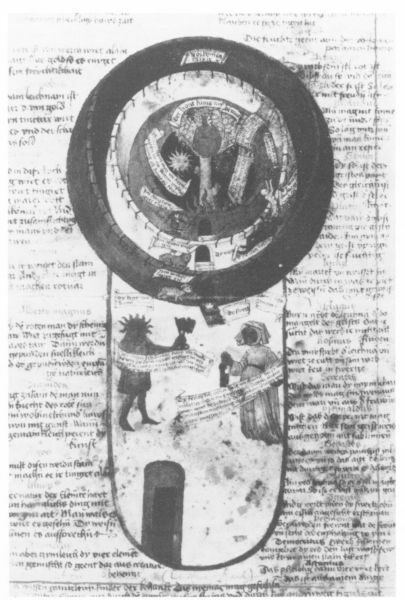 This emblem clearly instructs us that alchemical imagery, particularly in the manuscript tradition, undergoes a process of development as later copyists rework the imagery, and may either misinterpret or misread the imagery in the manuscript they are copying, or alternatively decide to give it a further layer of imagery that reflects their particular understanding of the work. Here again is the Leiden version. Like the Rawlinson it clearly depicts a king, though not a double faced one. We also have a clear depiction of a Aries the ram, the four coloured columns, and the male and female figures holding keys.